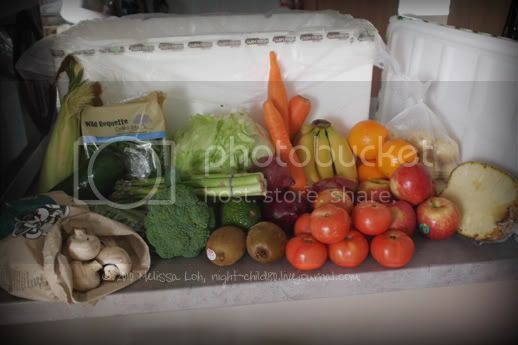 It's our 3rd Farm Fresh Central small mixed box! I'm starting to think the $30 box could last us a week and a half. I've had to throw out a banana as it got overripe by the time we got round to eating it. That still hasn't put a dent in our growing collection of oranges though. I had the same problem with the fruits from my farmer's direct box. We were getting way more than we could consume. That is, until we got the juicer. Now it just disappears! We don't have the cupboard or bench space for a juicer, though what little we have is reserved for the eventual mixer to join the family. I'm wondering if there's a recipe out there that calls for a lot of oranges. That's the way we're using up our apples. orange and yoghurt cake! Not sure if you need a lot of it, but it sure sounds yum. My friend makes an awesome one (http://offthespork.com) should be on one of the recent entries. Or orange and avocado salad. That's how I used to get rid of the orange and avocados that I kept getting in the box. Super yummy salad too! *reads the recipe* It only takes a quarter cup of orange juice. But it looks so moist! I might make 2 to take into work and the SO's work. I made it for a birthday party and it was very very popular! that looks like a lot for $30....hey, do you have to pay for delivery with the automatic thing you've set up? We've been checking and the answer appears to be 'no'. Our credit card only gets charged the $30, so all good! Hmmm... that's an idea. I might make that next time we get those huge mammoth tusk bananas. No juicer. Not even the retro hand juicer. I might try out Celeste's link to the orange and yoghurt cake. It looks so moist and yummy!